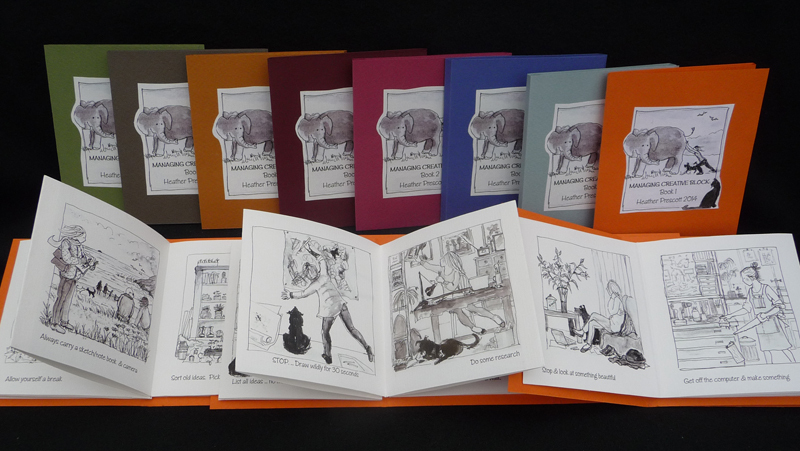 BABE (Bristol Book Arts Event) at the Arnolfini was held over two days last weekend … April 11th & 12th. All 3 floors of the Arnolfini gallery were full to bursting with exhibitors showing & selling the widest possible variety of artists books. My table had both original print books and digital books created from prints and drawings. It was very busy all the time and sales were rewardingly brisk which was very satisfying after so much time spent making beforehand. So much time making that this post is appearing after the event when it should have been posted beforehand. The additional value from the Fair was the sharing and the meetings that occurred both between the participants and with the visitors. I came away inspired with new ideas, new ways of working and enthusiam. Here is some of the new work organised into books. 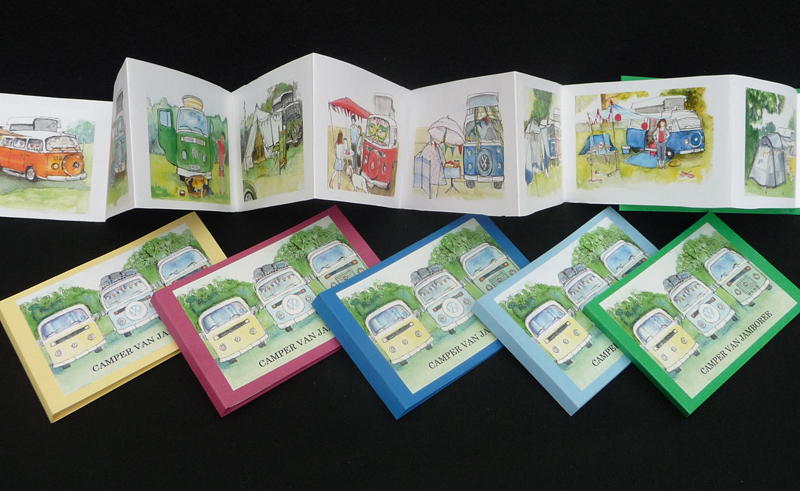 Overcoming Creative Block made into a set of 3 books of “The 28 Day Drawing Challenge in 2014” and Campervan Jamboree from a set of drawings started last year and finally finished this March. The Snowdrops and Wild Sweet Pea Books are reduction lino cuts cut and printed in March/April. 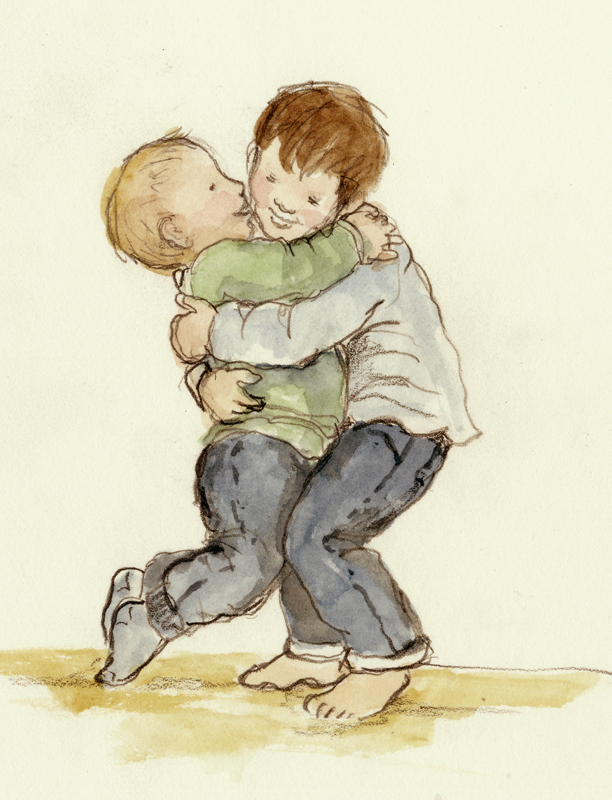 I have always placed importance on drawing that is objective, accurate and expressive combined with lots of practice. However I frequently don’t draw often enough to meet my own expectations so when I began the 28 day drawing challenge I wasn’t sure exactly what I would draw or even if I would be able to keep up with the challenge. I was hoping for a destination without knowing if there was one . 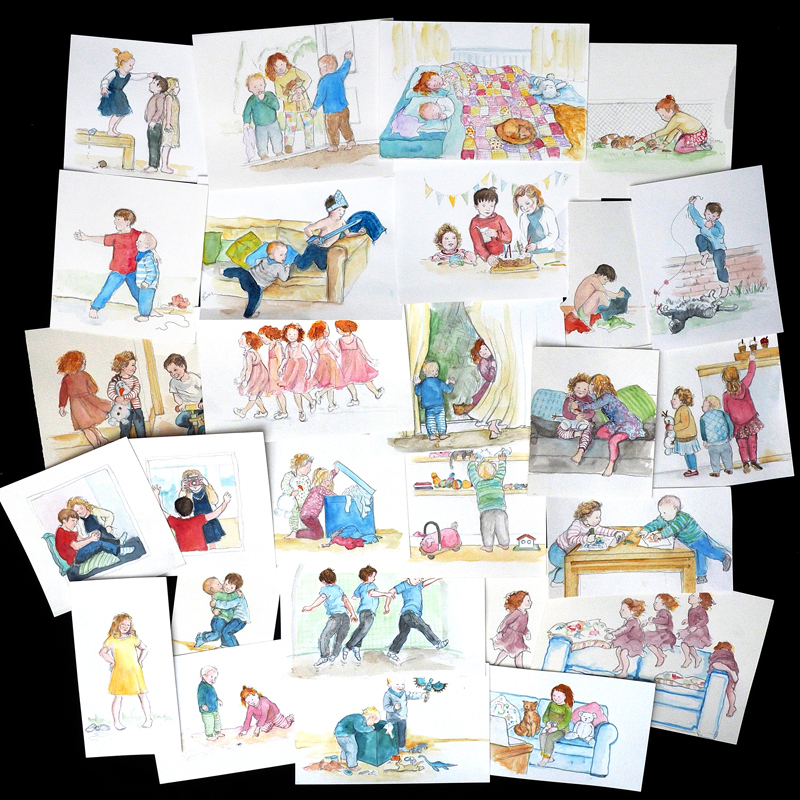 I managed 28 drawings, and quite a few extras keeping up and drawing every day. I knew my subject matter woud be children playing and doing but it took about 10 days to know what the destination would be … A “doing” abecedary. I slipped back into my illustrative style of working from years ago and it was suddenly easy. The discipline of doing a drawing a day meant my drawing improved as I became more critical and more familiar with subject & technique. The boundaries I set for myself acted as restrictions on my natural tendency to wander creatively off course. I restricted the time, technique, size & the all important subject matter. The results should now be in Glasgow for the exhibition opening this evening. Will I keep it up? …. Well I have just bought myself a beautiful handmade blank journal … just for drawing. My angels are hanging in the entrance porch and there are over 100 more angels inside created by everyone from professional artists to schoolchildren. Three life sized figurative prints of “angels” are now finished and on their way to Clun in South Shropshire to hang in St George’s church porch.. They are going there to celebrate the Angel Festival taking place all over Christmas beginning next Friday December 12th. Each Angel was made from 3 floating layers partially stitched together, A background wood and mono print onto fabric, a middle layer of stitched & glued collage and a transparent top layer of painted net. The Angel Festival was inspired by the 22 Angels carved in wood up in the roof of St Georges church. Amazingly the carvings, survived the reformation possibly because they were hidden by a false ceiling. Today I finished and then exhibited my altered book about two major battles of WW1, The Marne & The Somme. I found the book which gave accounts of several historic battles in a second hand bookshop. First I took it apart, removed all but the WW1 references and then printed exploding poppies and barbed wire over all the remaining pages on both sides. I then reconstructed the book with a new cover. Today it went on display beneath one of the five poppy hangings I printed with the same silk screens. The book & hangings are in the display by Marches Book Arts Group in the beautiful church of St Michael’s in Waters Upton (North of Shrewsbury). The exhibition can be seen this weekend on Sat. 8th Nov between 12noon – 4.00 & then on Remembrance Sunday 9th Nov. between 10.15 – 12.15. This is the forth venue for the work since June and because of the date this time has extra special significance. This is part of the altered book path leading to the church door. 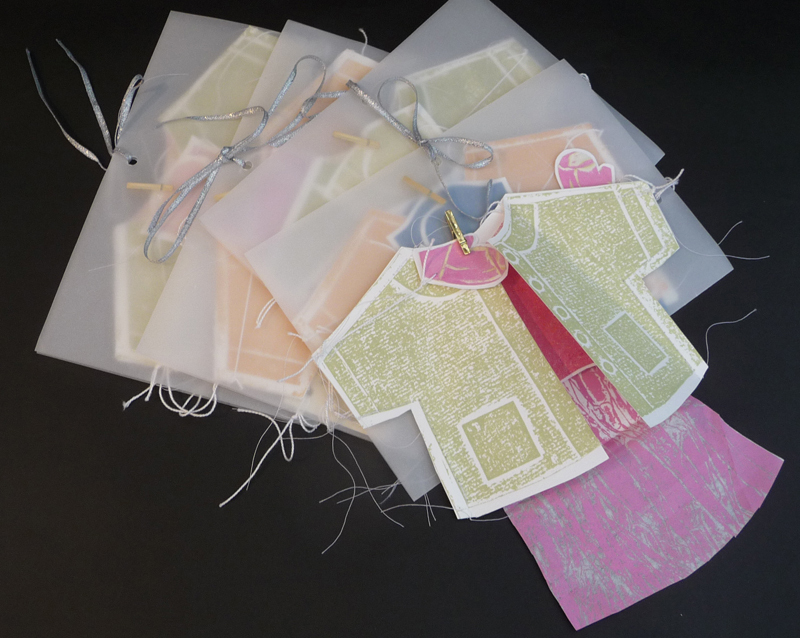 The books are made from original collagraph prints cut and sewn together to make items of clothing including hats and gloves to keep away the cold. 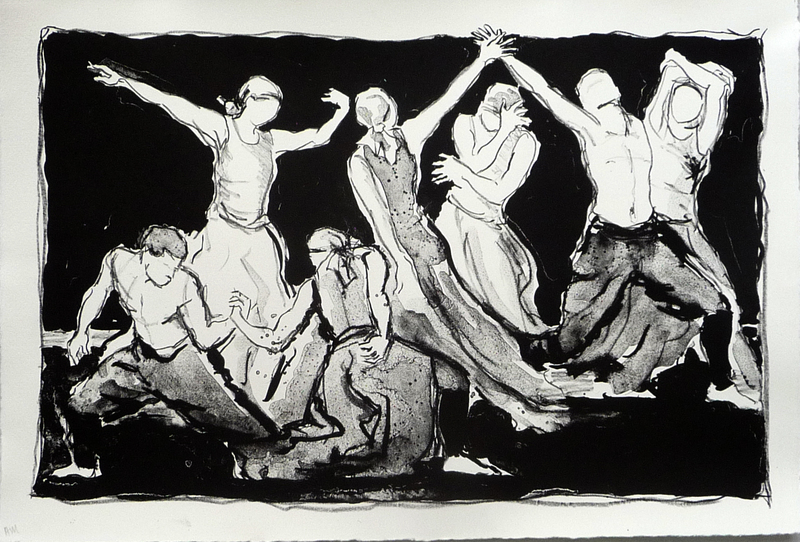 Delighted to learn this evening that my lithograph of dancers has won second prize in the Shropshire Open.